After leaving Gullfoss and returning to the Ring Road, I headed east towards Vík. Located about halfway along the southern coast, Vík is famous for its black sand beaches and its proximity to Dyrhólaey, a naturally formed arch in the cliff that’s so big that ships can sail through it at certain tides. I was losing sunlight, but that didn’t stop me from stopping and taking pictures all along the road. 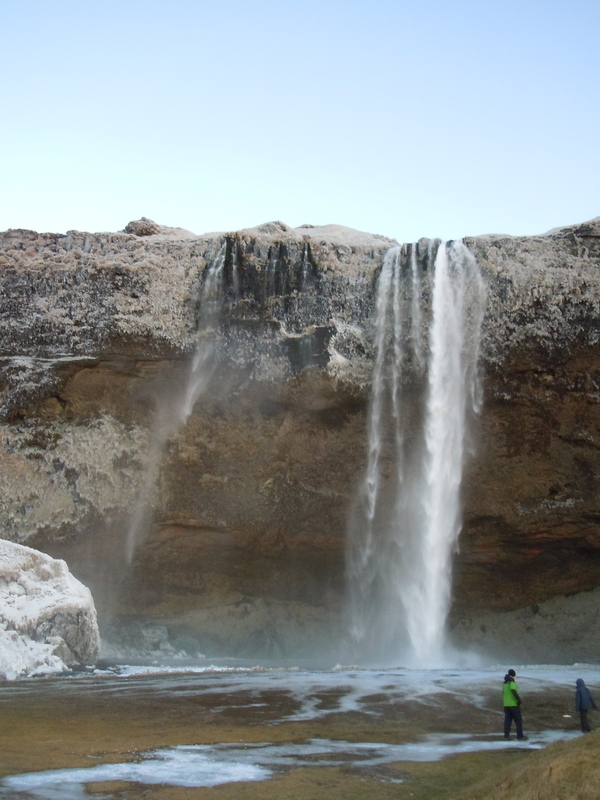 Seljalandsfoss and the icy walkway of death. There are several houses that look like they’re built right into the mountains with sod roofs, a style of Icelandic turf house started in the late 1700s called burstabær. A brief stop at Seljalandsfoss, a gorgeous waterfall that is primarily known as “the one you can walk behind.” This is true—you could walk behind it—if the pathway leading to it wasn’t completely iced over (see Gullfoss walkway). Still worth the stop. There are two Ethiopian restaurants in Iceland. I was bemused by this fact when my friend Ernesto told me; I squealed when I actually spotted the restaurant in Flúðir. Passing by the infamous volcano Eyjafjallajökull, the hard-to-pronounce volcano that erupted in 2010 and brought Europe to a grinding halt. There’s a small museum there, but other than that, it’s just another peak on a gorgeous stretch of snow-capped mountains. Offshore from Vík are finger-like stacks of basalt rock, remnants of the cliff line that has eroded. Sure, there’s a reasonable explanation, but I like the story that tells that they’re really trolls who tried to drag their boats out to sea, only to be caught by the rising dawn and turned to stone. North of Vík is the bulk of the Mýrdalsjökull glacier, Iceland’s fourth largest. Approximately 1800 feet below the ice lies the dormant sub-glacial Katla volcano. Katla is one of Iceland’s most active volcanoes and has erupted roughly every 50 years, the last time in 1918. I hoped that she wasn’t in the mood for another eruption. 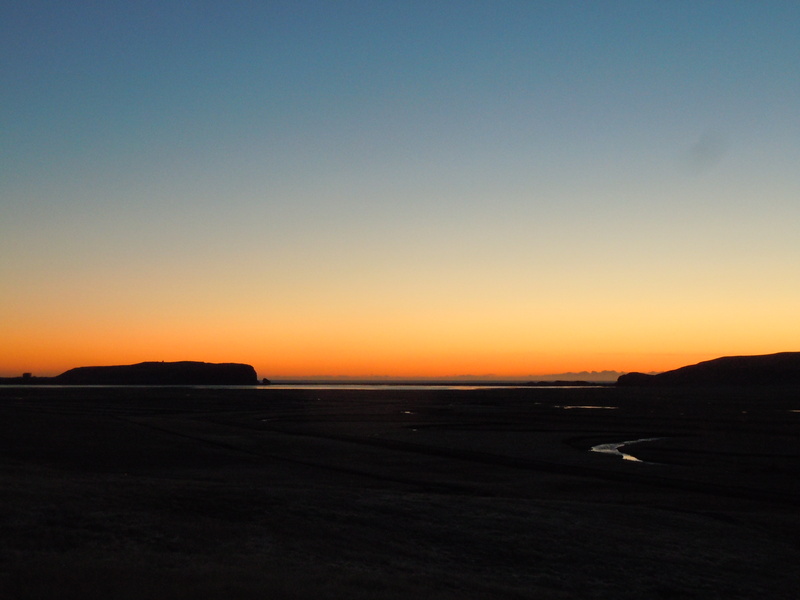 The black sand beaches of Vik at sunset. I rolled into Vík right around sunset and found the hostel that I booked that morning. Located up on the hill above the town, it was relatively easy to find due to the giant Youth Hostel Association logo that’s painted on the side of the building. I was one of six guests that night—I ended up sharing a six bedroom dorm with three girls from Taiwan who came in later and ended up staying out pretty much all night. Doing what, I have no idea. Vík was dead. I can see as how the town could be a hopping place in the summertime, but in November, I started looking for tumbleweeds blowing down the street. The hostel manager kindly told me that there were two places open for dinner: the “nice” restaurant at Hotel Lundi and Vikurskali, the grill at the N1 gas station. I grabbed some of the brochures provided by the hostel for reading material (“What to Do in the Event of a Volcanic Eruption” was of particular interest) and headed to the grill. The “Commisionnaire’s Burger.” If you happen to remember the TV Show “The Commish,” I think he’d approve. 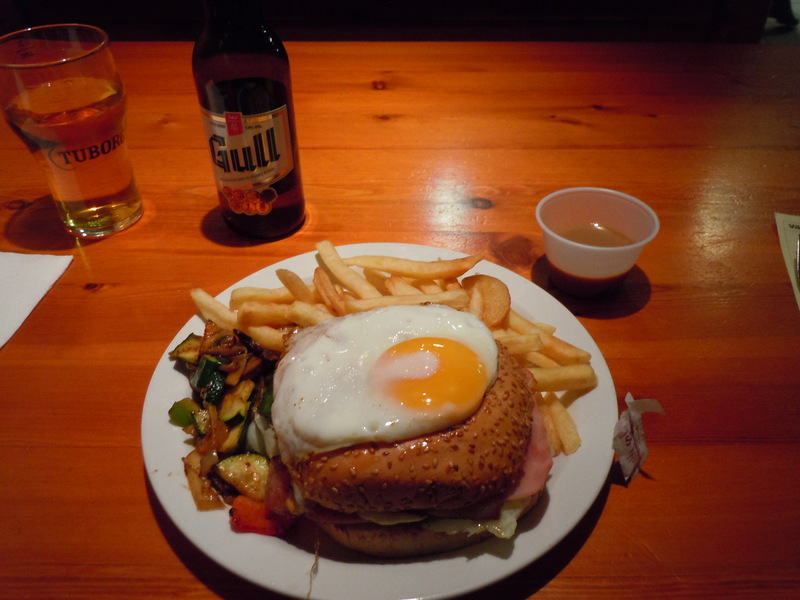 Though I wasn’t quite sure about the grill (I was the only one there at first, but it soon started to fill up), the picture menu at least made it easy to order the “Commisionnaire’s Burger”: a burger topped with ham, cheese, bacon, secret sauce and a fried egg. I don’t care who you are: a burger topped with two types of pork and an egg is perfect after a long, chilly day on the road—even if the egg, mystifyingly, comes on top of the bun. The fries and sauteed veggies were excellent, too. If you happen to be rolling through Vík, I highly recommend stopping for a snack. Back at the hostel, I checked my Aurora app in the hopes that it might indicate a good night to catch the Northern Lights. It didn’t seem hopeful, but it was the only clear night that I’d experienced thus far. I decided to take a chance and headed out about 10:30 p.m. 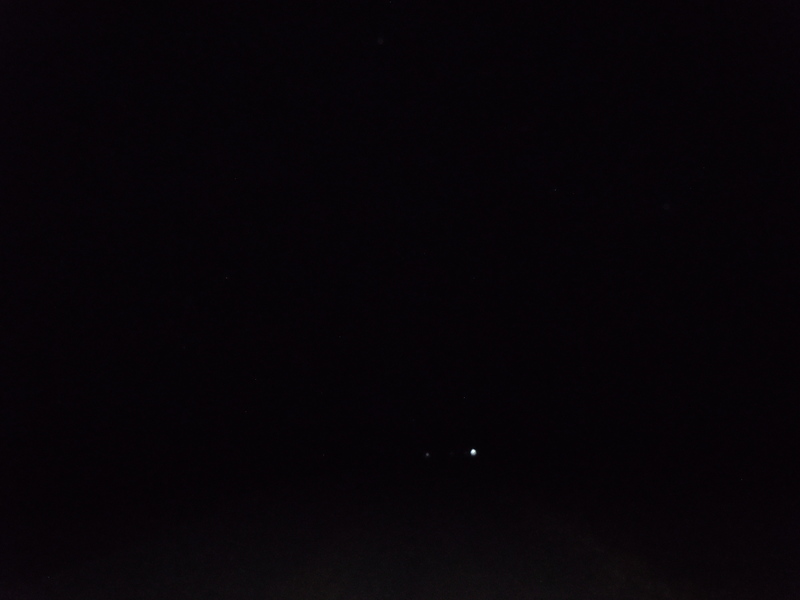 Thanks to my handy GPS, I started back west on the main road and took a right onto a smaller, unpaved road towards the mountains (I wouldn’t have known it was there without the GPS, it was so dark). After about a mile and a half of bumpy road, I turned off my lights and started peering at the sky. My attempt to take a picture of the Northern Lights. Was that just light from a town on the other side the mountains? Wait—there are no towns over the mountains. There they were—the Northern Lights, Aurora Borealis. At first I thought I was looking at clouds (yeah, clouds in the dark. Obviously I was tired), but as my eyes adjusted to the darkness, I could see the green band undulating in a leisurely wave with a smattering of stars below and above. It was entrancing. I sat in my car for almost two hours, switching on the heat when I needed it. It was such a good show that I couldn’t tear my eyes from the sky. I tried to take a few pictures, but all that came out was the darkness. * No matter. The night is firmly placed in my mind: the stars shooting across the sky, the absolute silence and stillness, the slow green dance of the Lights. *If you want some tips on how to photograph the Northern Lights, I found a good site here. Of course, I found it after my trip. Tags: Aurora Borealis, Iceland, Northern Lights, Ring Road, Vik. Bookmark the permalink.